In this chapter you'll look at one way to develop Web-based programs in Common Lisp, using the open-source AllegroServe Web server. This isn't meant as a full introduction to AllegroServe. And I'm certainly not going to cover anything more than a tiny corner of the larger topic of Web programming. My goal here is to cover enough of the basics of using AllegroServe that you'll be able, in Chapter 29, to develop an application for browsing a library of MP3 files and streaming them to an MP3 client. Similarly, this chapter will serve as a brief introduction to Web programming for folks new to the topic. Figure 26-1 shows how the browser renders this page. The browser and server communicate using a protocol called the Hypertext Transfer Protocol (HTTP). While you don't need to worry about the details of the protocol, it's worth understanding that it consists entirely of a sequence of requests initiated by the browser and responses generated by the server. That is, the browser connects to the Web server and sends a request that includes, at the least, the desired URL and the version of HTTP that the browser speaks. The browser can also include data in its request; that's how the browser submits HTML forms to the server. To reply to a request, the server sends a response made up of a set of headers and a body. The headers contain information about the body, such as what type of data it is (for instance, HTML, plain text, or an image), and the body is the data itself, which is then rendered by the browser. The server can also send an error response telling the browser that its request couldn't be answered for some reason. When generating its response to a request, server-side code has four main pieces of information to act on. The first piece of information is the requested URL. Typically, however, the URL is used by the Web server itself to determine what code is responsible for generating the response. Next, if the URL contains a question mark, everything after the question mark is considered to be a query string, which is typically ignored by the Web server except that it makes it available to the code generating the response. Most of the time the query string contains a set of key/value pairs. The request from the browser can also contain post data, which also usually consists of key/value pairs. Post data is typically used to submit HTML forms. The key/value pairs supplied in either the query string or the post data are collectively called the query parameters. Finally, in order to string together a sequence of individual requests from the same browser, code running in the server can set a cookie, sending a special header in its response to the browser that contains a bit of opaque data called a cookie. After a cookie is set by a particular server, the browser will send the cookie with each request it sends to that server. The browser doesn't care about the data in the cookie--it just echoes it back to the server for the server-side code to interpret however it wants. These are the primitive elements on top of which 99 percent of server-side Web programming is built. The browser sends a request, the server finds some code to handle the request and runs it, and the code uses query parameters and cookies to determine what to do. You can serve Web content using Common Lisp in a number of ways; there are at least three open-source Web servers written in Common Lisp as well as plug-ins such as mod_lisp5 and Lisplets6 that allow the Apache Web server or any Java Servlet container to delegate requests to a Lisp server running in a separate process. For this chapter, you'll use a version of the open-source Web server AllegroServe, originally written by John Foderaro at Franz Inc.. AllegroServe is included in the version of Allegro available from Franz for use with this book. If you're not using Allegro, you can use PortableAllegroServe, a friendly fork of the AllegroServe code base, which includes an Allegro compatibility layer that allows PortableAllegroServe to run on most Common Lisps. The code you'll write in this chapter and in Chapter 29 should run in both vanilla AllegroServe and PortableAllegroServe. The server is now running in your Lisp. It's possible you'll get an error that says something about "port already in use" when you try to start the server. This means port 2001 is already in use by some other server on your machine. In that case, the simplest fix is to use a different port, supplying a different argument to start and then using that value instead of 2001 in the URLs used throughout this chapter. You can continue to interact with Lisp via the REPL because AllegroServe starts its own threads to handle requests from browsers. This means, among other things, that you can use the REPL to get a view into the guts of your server while it's running, which makes debugging and testing a lot easier than if the server is a complete black box. Assuming you're running Lisp on the same machine as your browser, you can check that the server is up and running by pointing your browser at http://localhost:2001/. At this point you should get a page-not-found error message in the browser since you haven't published anything yet. But the error message will be from AllegroServe; it'll say so at the bottom of the page. On the other hand, if the browser displays an error dialog that says something like "The connection was refused when attempting to contact localhost:2001," it means either that the server isn't running or that you started it with a different port than 2001. You can publish it individually with the publish-file function. The :path argument is the path that will appear in the URL requested by the browser, while the :file argument is the name of the file in the file system. After evaluating the publish-file expression, you can point your browser to http://localhost:2001/hello.html, and it should display a page something like Figure 26-2. Now you can publish the whole /tmp/html/ directory (and all its subdirectories) with the publish-directory function. In this case, the :prefix argument specifies the beginning of the path part of URLs that should be handled by this entity. Thus, if the server receives a request for http://localhost:2001/foo/bar.html, the path is /foo/bar.html, which starts with /. This path is then translated to a filename by replacing the prefix, /, with the destination, /tmp/html/. Thus, the URL http://localhost:2001/hello.html will still be translated into a request for the file /tmp/html/hello.html. Publishing entities that generate dynamic content is nearly as simple as publishing static content. The functions publish and publish-prefix are the dynamic analogs of publish-file and publish-directory. The basic idea of these two functions is that you publish a function that will be called to generate the response to a request for either a specific URL or any URL with a given prefix. The function will be called with two arguments: an object representing the request and the published entity. Most of time you don't need to do anything with the entity object except to pass it along to a couple macros I'll discuss in a moment. On the other hand, you'll use the request object to obtain information submitted by the browser--query parameters included in the URL or data posted using an HTML form. For a trivial example of using a function to generate dynamic content, let's write a function that generates a page with a different random number each time it's requested. The macros with-http-response and with-http-body are part of AllegroServe. The former starts the process of generating an HTTP response and can be used, as here, to specify things such as the type of content that will be returned. It also handles various parts of HTTP such as dealing with If-Modified-Since requests. The with-http-body actually sends the HTTP response headers and then executes its body, which should contain code that generates the content of the reply. Within with-http-response but before the with-http-body, you can add or change HTTP headers to be sent in the reply. The function request-reply-stream is also part of AllegroServe and returns the stream to which you should write output intended to be sent to the browser. Now you're ready to publish this function. As it does in the publish-file function, the :path argument specifies the path part of the URL that will result in this function being invoked. The :function argument specifies either the name or an actual function object. Using the name of a function, as shown here, allows you to redefine the function later without republishing and have AllegroServe use the new function definition. After evaluating the call to publish, you can point your browser at http:// localhost:2001/random-number to get a page with a random number on it, as shown in Figure 26-3. Although using FORMAT to emit HTML works fine for the simple pages I've discussed so far, as you start building more elaborate pages it'd be nice to have a more concise way to generate HTML. Several libraries are available for generating HTML from an s-expression representation including one, htmlgen, that's included with AllegroServe. In this chapter you'll use a library called FOO,10 which is loosely modeled on Franz's htmlgen and whose implementation you'll look at in more detail in Chapters 30 and 31. For now, however, you just need to know how to use FOO. FOO can use the s-expression representation of HTML in two ways. The function emit-html takes an HTML s-expression and outputs the corresponding HTML. However, this has to build a tree containing a 10,000-element list before it can even start emitting HTML, and the whole s-expression will become garbage as soon as the HTML is emitted. To avoid this inefficiency, FOO also provides a macro html, which allows you to embed bits of Lisp code in the middle of an HTML s-expression. The macro version will be quite a bit more efficient than the emit-html version. Not only do you never have to generate an s-expression representing the whole page, also much of the work that emit-html does at runtime to interpret the s-expression will be done once, when the macro is expanded, rather than every time the code is run. Of course, generating HTML output is only half of Web programming. The other thing you need to do is get input from the user. As I discussed in the "A 30-Second Intro to Server-Side Web Programming" section, when a browser requests a page from a Web server, it can send query parameters in the URL and post data, both of which act as input to the server-side code. you should get back a page similar to the one shown in Figure 26-4. (:form :method "POST" :action "/show-query-params"
Point your browser to http://localhost:2001/simple-form, and you should see a page like the one in Figure 26-5. If you fill in the form with the "abc" and "def" values, clicking the Okay button should take you to a page like the one in Figure 26-6. Because request-query-value can return either NIL or an empty string, you have to deal with both those cases when parsing the parameter into a number to pass to RANDOM. You can deal with a NIL value when you bind limit-string, binding it to "" if there's no "limit" query parameter. Then you can use the :junk-allowed argument to PARSE-INTEGER to ensure that it returns either NIL (if it can't parse an integer from the string given) or an integer. In the section "A Small Application Framework," you'll develop some macros to make it easier to deal with grabbing query parameters and converting them to various types. In AllegroServe you can send a Set-Cookie header that tells the browser to save a cookie and send it along with subsequent requests by calling the function set-cookie-header within the body of with-http-response but before the call to with-http-body. The first argument to the function is the request object, and the remaining arguments are keyword arguments used to set the various properties of the cookie. The only two you must pass are the :name and :value arguments, both of which should be strings. The other possible arguments that affect the cookie sent to the browser are :expires, :path, :domain, and :secure. After you've set a cookie, you can use the function get-cookie-values to get an alist containing one name/value pair for each cookie sent by the browser. From that alist, you can pick out individual cookie values using ASSOC and CDR. The first time you load the page http://localhost:2001/show-cookies it should say "No cookies" as shown in Figure 26-7 since you haven't set any yet. 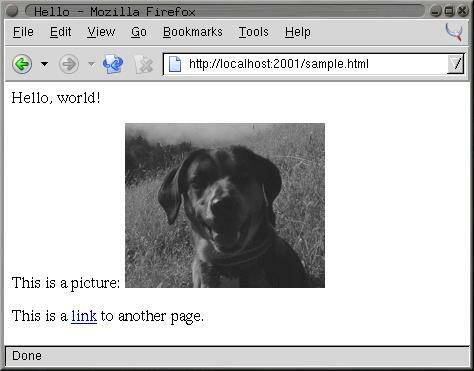 If you enter the URL http://localhost:2001/set-cookie, your browser should display a page like the one in Figure 26-8. Additionally, the server will send a Set-Cookie header with a cookie named "MyCookie" with "A cookie value" as its value. If you click the link Look at cookie jar, you'll be taken to the /show-cookies page where you'll see the new cookie, as shown in Figure 26-9. Because you didn't specify an :expires argument, the browser will continue to send the cookie with each request until you quit the browser. Although AllegroServe provides fairly straightforward access to all the basic facilities you need to write server-side Web code (access to query parameters from both the URL's query string and the post data; the ability to set cookies and retrieve their values; and, of course, the ability to generate the response sent back to the browser), there's a fair bit of annoyingly repetitive code. For instance, every HTML-generating function you write is going to take the arguments request and entity and then will contain calls to with-http-response, with-http-response, and--if you're going to use FOO to generate HTML--with-html-output. Then, in functions that need to get at query parameters, there will be a bunch of calls to request-query-value and then more code to convert the string returned to whatever type you actually want. Finally, you need to remember to publish the function. To reduce the amount of boilerplate you have to write, you can write a small framework on top of AllegroServe to make it easier to define functions that handle requests for a particular URL. where the body is the code to emit the HTML of the page. It'll be wrapped in a call to FOO's html macro, so for simple pages it might contain nothing but s-expression HTML. The type must be a name recognized by define-url-function. I'll discuss in a moment how to define new types. The default-value must be a value of the given type. Finally, stickiness, if supplied, indicates that the parameter's value should be taken from an appropriately named cookie if no query parameter is supplied and that a Set-Cookie header should be sent in the response that saves the value in the cookie of the same name. Thus, a sticky parameter, after being explicitly supplied a value via a query parameter, will keep that value on subsequent requests of the page even when no query parameter is supplied. The name of the cookie used depends on the value of stickiness: with a value of :global, the cookie will be named the same as the parameter. Thus, different functions that use globally sticky parameters with the same name will share the value. If stickiness is :package, then the cookie name is constructed from the name of the parameter and the package of the function's name; this allows functions in the same package to share values but not have to worry about stomping on parameters of functions in other packages. Finally, a parameter with a stickiness value of :local will use a cookie made from the name of the parameter, the package of the function name, and the function name, making it unique to that function. If you wanted the limit argument to be sticky, you could change the limit declaration to (limit integer 1000 :local). Let's take it bit by bit, starting with the first few lines. In other words, declaring a parameter with just a symbol is the same as declaring a nonsticky, string parameter with no default value. Then comes the PROGN. You must expand into a PROGN because you need to generate code to do two things: define a function with DEFUN and call publish. You should define the function first so if there's an error in the definition, the function won't be published. The first two lines of the DEFUN are just boilerplate. The rest is just more boilerplate, putting the body from the define-url-function definition in the appropriate context of with-http-body, with-html-output, and html macros. Then comes the call to publish. The expression (format nil "/~(~a~)" name) is evaluated at macro expansion time, generating a string consisting of /, followed by an all-lowercase version of the name of the function you're about to define. That string becomes the :path argument to publish, while the function name is interpolated as the :function argument. Now let's look at the helper functions used to generate the DEFUN form. To generate parameter bindings, you need to loop over the params and collect a snippet of code for each one, generated by param-binding. That snippet will be a list containing the name of the variable to bind and the code that will compute the value of that variable. The exact form of code used to compute the value will depend on the type of the parameter, whether it's sticky, and the default value, if any. Because you already normalized the params, you can use DESTRUCTURING-BIND to take them apart in param-binding. The functions that compute the query parameter and cookies names are similarly straightforward. To generate the code that sets cookies for sticky parameters, you again loop over the list of parameters, this time collecting a snippet of code for each sticky param. You can use the when and collect it LOOP forms to collect only the non-NIL values returned by set-cookie-code. Assuming this code will occur in a context where x is the name of a variable, this looks good. Once again, macros have allowed you to distill the code you need to write down to its essence--in this case, the data you want to extract from the request and the HTML you want to generate. That said, this framework isn't meant to be the be-all and end-all of Web application frameworks--it's just a little sugar to make it a bit easier to write simple apps like the one you'll write in Chapter 29. But before you can get to that, you need to write the guts of the application for which the Chapter 29 application will be the user interface. You'll start in the next chapter with a souped-up version of the database you wrote in Chapter 3, this time to keep track of ID3 data extracted from MP3 files. 1Readers new to Web programming will probably need to supplement this introduction with a more in-depth tutorial or two. You can find a good set of online tutorials at http://www.jmarshall.com/easy/. 2Loading a single Web page may actually involve multiple requests--to render the HTML of a page containing inline images, the browser must request each image individually and then insert each into the appropriate place in the rendered HTML. 3Much of the complexity around Web programming is a result of trying to work around this fundamental limitation in order to provide a user experience that's more like the interactivity provided by desktop applications. 7AllegroServe also provides a framework called Webactions that's analogous to JSPs in the Java world--instead of writing code that generates HTML, with Webactions you write pages that are essentially HTML with a bit of magic foo that turns into code to be run when the page is served. I won't cover Webactions in this book. 8Loading PortableAllegroServe will create some other packages for the compatibility libraries, but the packages you'll care about are those three. 9The ~@ followed by a newline tells FORMAT to ignore whitespace after the newline, which allows you to indent your code nicely without adding a bunch of whitespace to the HTML. Since white-space is typically not significant in HTML, this doesn't matter to the browser, but it makes the generated HTML source look a bit nicer to humans. 10FOO is a recursive tautological acronym for FOO Outputs Output. 11For information about the meaning of the other parameters, see the AllegroServe documentation and RFC 2109, which describes the cookie mechanism. and the value of y, if not explicitly supplied, would be twice the value of x.